Today I wanted to make something fun and quick to do a little decorating. With the cabinets being redone, it is hard to keep the house clean and redo things for the season, but there are some spots I can play with that don't get messed up by my husband. I wanted something to use as bowl fillers, so I tried two different ornies. One is the flag pillows, a quick and easy project. I used red and white ticking for the flag, then I sewed a backing onto it and lightly stuffed it. I sewed the star onto the blue piece and put that on with a simple running stitch. I wanted to make a rag flag to put in the basket, but didn't have time today, so I put a piece of blue ticking in it, for now. It looks light in the photo, but it has been antiqued and a lot darker in person. A couple of rag balls and a few things I had in the house and I have a little setting for the top of my chest. The Patriotic mouse is a piece that I won from Ragpatch Primitives. The firecrackers I made by using scraps, so the size was dependent on what I grabbed. They measure about 6" x 2". 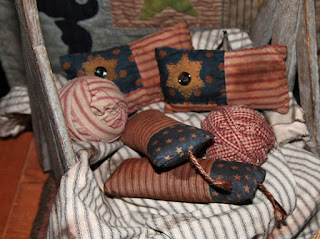 I sewed them on the machine and left the tops open, then added a piece of jute for the fuse. They are stained with a combination of mahogany and walnut stain. 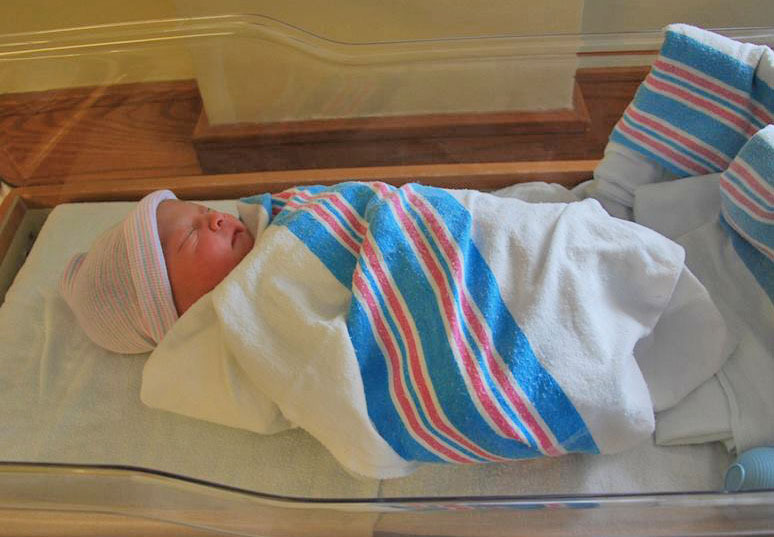 And of course, being the proud Grandma, I had to show a new photo of my grandson. Grandpa is holding him in his lap. It was quite the holiday weekend, I hope your's was much more relaxing. Our DIL went into labor on Saturday and was in labor for two days, so no family cookout, this year. This morning she started pushing and that lasted 4 hours, ugh, mine was in and done in an hour, that is the way to do it, lol. 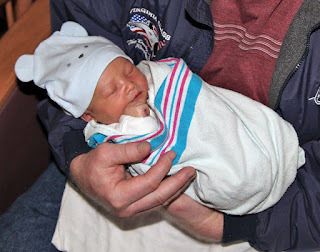 And here is our new Grandson, Nicholas William St. Germain. 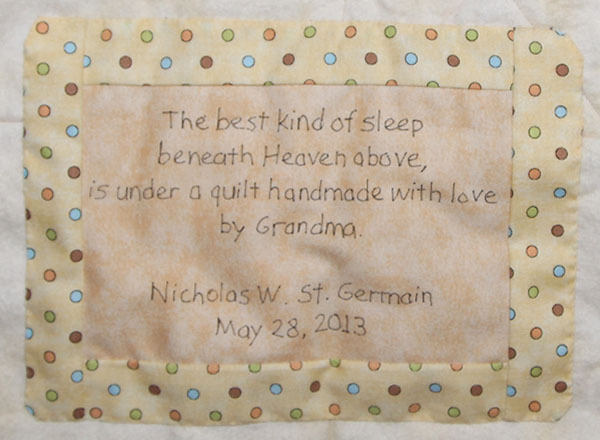 And just in time, I put the label on his quilt today. I had the quilt and finished yesterday and waited for his birthday to add the label. I finally got my machine back, after repairs and started by doing a simple X in the small blocks. Then I went to do free motion in the larger blocks and couldn't find the free motion. She went and upgraded my computer system and I couldn't find the button to switch over and the shop was closed, so I had to do straight stitching and I cannot sew a straight line. I kept it simple, at this point, I gave up, nothing seemed to be working, the thread was jamming and turning into nests, so whatever was quickest, is what I did. I left the outside border plain, since it was starting to bunch and quilting would have left bad puckers;) This is after a wash, so I left the crinkles. I looked online and found this saying and thought it was a cute idea for the label, then I just added by grandma. I printed out what I wanted to say, from the computer, then I traced it onto the fabric, using a Faber-Castell artist pen. I used some of the yellow dot fabric from the curtains as a border. I still do not know what to do with the curtains, I made a mess and not sure if my idea is good, so I might give up on that, not my week for thinking. One thing we did yesterday, was take a walk at one of our favorite parks by the ocean. I wanted to stay close to the hospital, just in case. 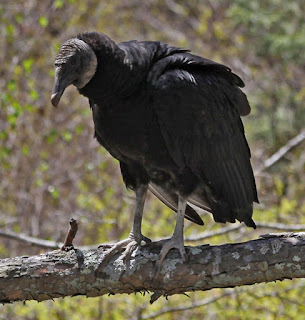 We noticed a bird on the path and he just stayed there, so I took some photos. Once we started walking, he flew up ahead of us and waiting till we got close and then flew forward. 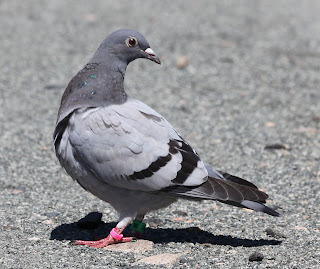 I noticed he had bands on him and found a local breader and sent him an email. He knew who bred that type and the owner emailed me and said he has been missing all week. I sent him a map with a dot of the location we saw him at, so i hope he finds him. I guess he is a young one and hasn't gotten his bearings down, too well. I wanted to make something fun for me and also a piece to enter into the contest at This-n-That Fabrics. 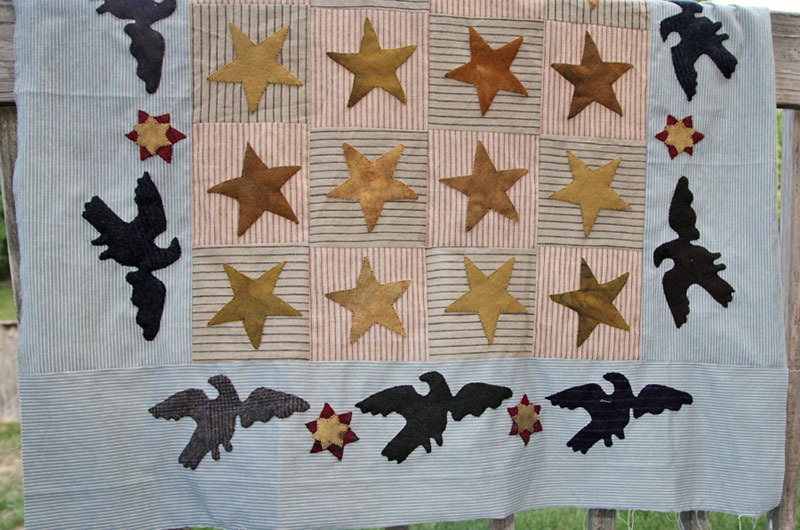 The contest is for patriotic quilts and I have always wanted to make this design by Barbara Brackman. You can find the pattern in the book, Civil War Woman. I soaked it it walnut crystals and tea but it didn't come out the way I wanted, so I laid it on the floor and sprayed it with my walnut ink. I wanted this one to look like an antique quilt and I really like how it came out. I used black pearl cotton to do the quilting. I also used fusi-boo for the batting. I really like how well it stays on and it has a nice soft touch. I wanted to redo my office into a guest room and thought that a civil war soldier theme would be fun to design around. Something fun for a little boy and a place where I can display my husband's trains and steins. 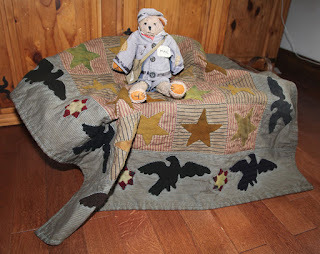 I tried different shots, I think this quilt needs to be draped on something or part of a cradle display. 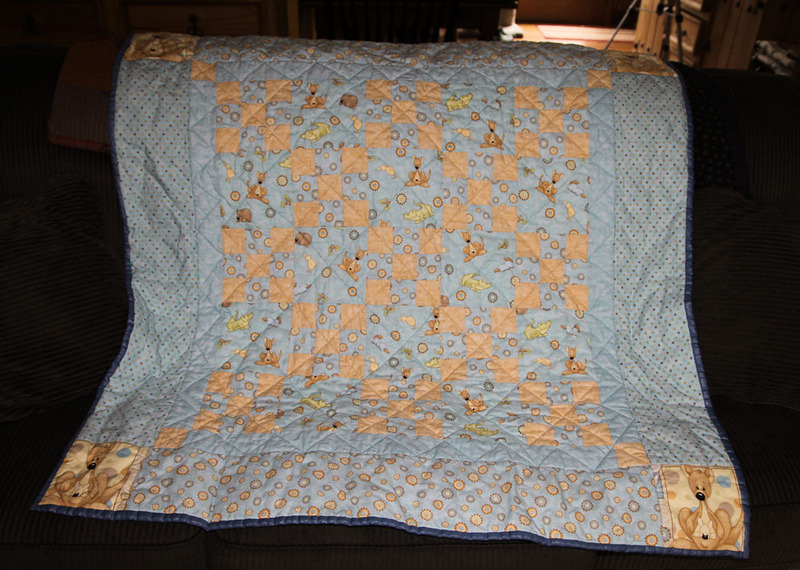 I reduced the blocks and applique by 20%, so my quilt came out as a 36" quilt. Here is how it looks spread out. I could not get a good straight on shot or an outdoor shot, another rainy day. You can see the dark areas in the quilt, in person, it looks like a quilt that has been used and aged. I had to lighten it a bit so you could see the detail. The good news is, the team came today and repaired the line and our water is back. 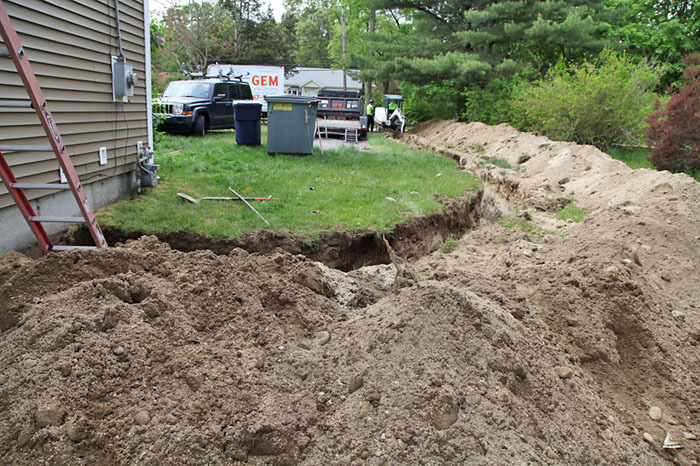 The bad is, it was the whole water line so they had to dig all the way out and the town had requirements for new things that we add to put in, as well, so the cost tripled. The bad news, Moki escaped a few times today, but all the noise scared him back in. 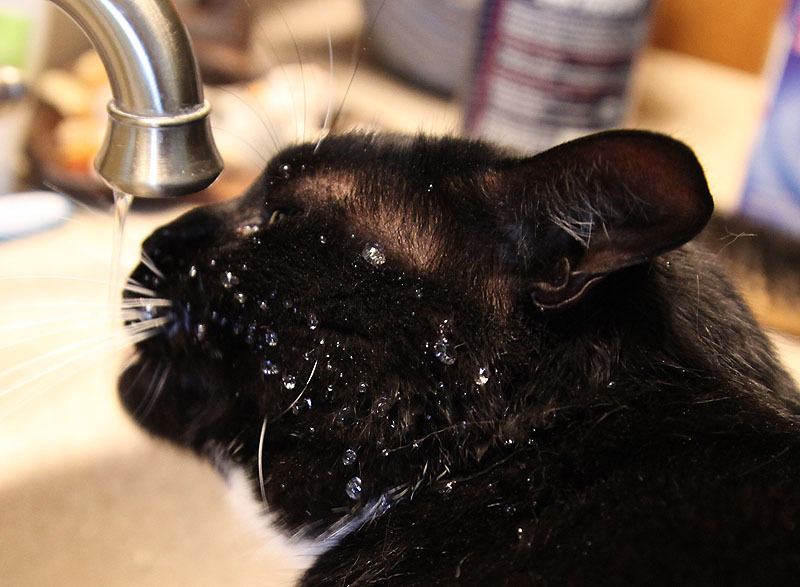 In other news, Moki is in water heaven, how he missed his running water. We also had a good day for hiking and I picked a spot that I had been wanting to visit. 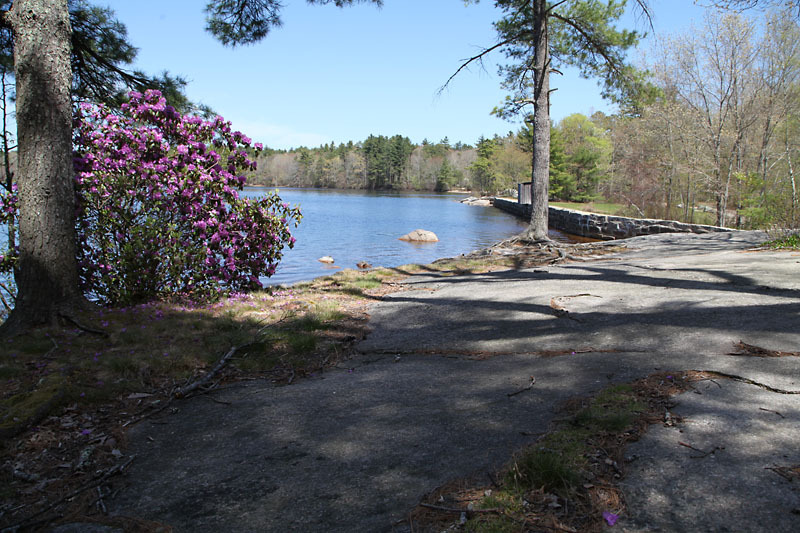 It is in the same area as our previous walk, but another path and pond, also the site where they filmed the kids on a rock, camping out. 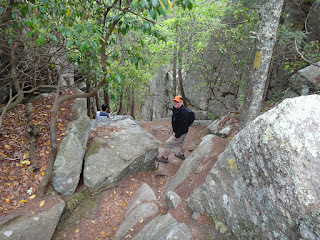 The bad news, the hike was constant, up and down hills and rocks. The good news, I made it to the rock and couldn't wait to get on top and get some shots of the lake below us. The bad news, I found out, there are no paths around it and I couldn't get past one ledge before I froze, so I had to concede to defeat. This week I planned on finishing the baby quilt. I had it all ready to quilt and that is when my machine decided to break, ugh. It seems the lever in the last thread slot is broken, so she is at the shop being fixed. Then my husband goes down to the basement and there is water on the floor. An outside pipe is leaking and soaking into the basement, so we had to have our water shut off. The plumbers have to get a permit to dig in that area so they won't be back till monday. I spent one day learning how much I need running water, lol. Our neighbor let us hook a hose up to her house, so now we have water, though it smells like new hose, definitely not something I will use for drinking or cooking. I worked on my quilt and decided to add my own touch. The original has stars and eagles but I wanted to add a little touch of my own to the borders and since it is americana, I went with red and yellow. I tried getting a good shot, but the wind kept blowing it, but you can get the general idea. I will be doing black outline stitches around the appliques and in the blocks. The design is by Barbara Brackman. 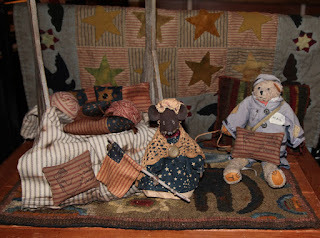 It is called Union Cradle Quilt and can be found in her book, Civil War Women. Yesterday I had a me day, nice quiet day all by myself and I wanted to make something just for fun. 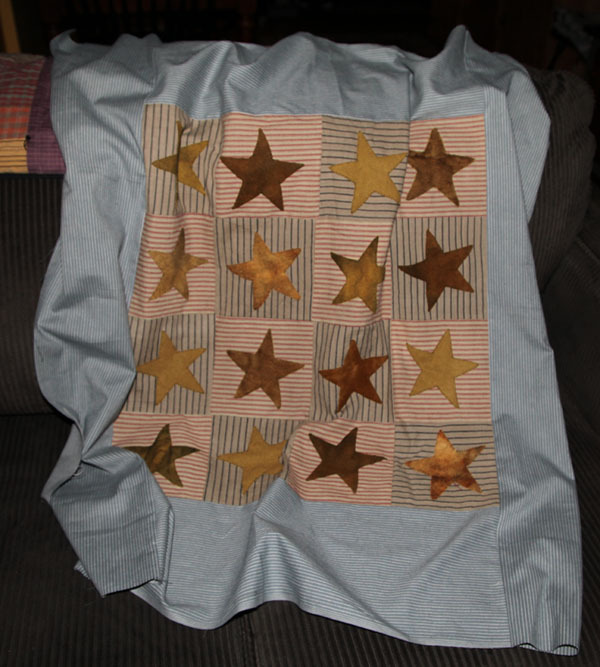 I have been wanting to make Barbara Brackman's , Union Cradle Quilt but wanted something I could make quick and easily, so I made a few changes. First I reduced the block size to 6" instead of 8". Then I reduced the appliques by 20% on the scanner to fit with the new size. The original quilt is in two colors, but I wanted a patriotic quilt, so I used red and blue ticking for the blocks and a blue ticking for the border. The border is lighter than I would have used, but it was all I had that worked and I plan on tea staining the quilt, when it is finished. 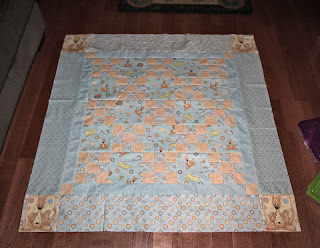 I also used wools for the appliqué and scraps that I had laying around. 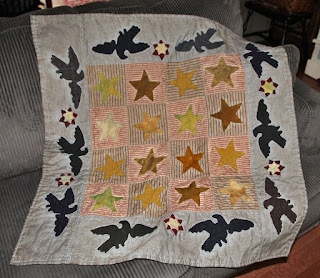 I want the quilt to be scrappy and old looking, when it is finished, so the wools are ones I cut out from old jackets. I made the border a bit larger since it will have eagle appliques on it and when the quilt is done, I will use a part of the border as the binding by folding it to the backside. I might just enter this one into the contest at This-n-That Fabrics. You can enter a patriotic quilt that you have made this year, has to be a new one and it ends this month. The outer blue is a brushed homespun, but the flash makes it look shiny. 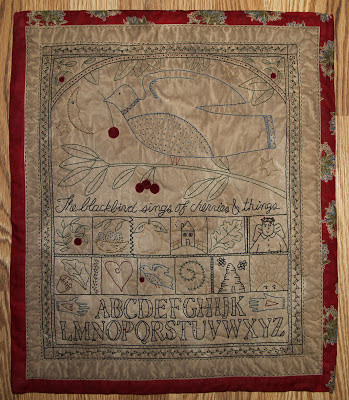 I finally finished my blackbird stitchery, design by Kathy Schmitz. It was really fun to do but it is harder to do the large designs and keep them straight since my light box is not that big, so I had to trace it on my glass door. I changed a few things, the berries were stitched, but I used wool. I also added a little stitching in the middle and the outside to tack it to the backing. It was way too bright for me, so I had to antique it, lol. The blues are not so bright, but hard to get all of the colors to show up nicely with a flash. I hope everyone has a wonderful Mother's Day! Bill has to work, so it might be a good day to get the baby quilt done. I was about to finish it and realized I didn't have anything that was big enough for the back and I wanted a nice solid piece for this. I got a nice flannel that is cream with splotches of pale yellow, so perfect for the backing. I kept this photo larger so you can see the details, not sure if blogger allows large anymore. It seems they keep changing my photo options. The border has also been changed, instead of a larger border, I made mine smaller so it is a combination border/binding. 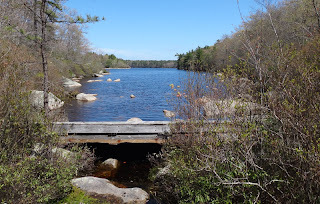 Yesterday was another beautiful day and I decided to go to a place, that I have never been and so glad I did. The hike was along varied paths and large pond all around the area. It is also the area where they filmed a lot of the movie, Moonrise Kingdom. They also filmed the movie on Jamestown Island and my SIL has a short part where Bruce Willis knocks on her door, looking for the missing kids. I am so jealous, lol. Some photos are taken with my canon and some with my sony, pocket camera. We weren't sure were to park, so we drove along a dirt road until we saw a sign for a trail. 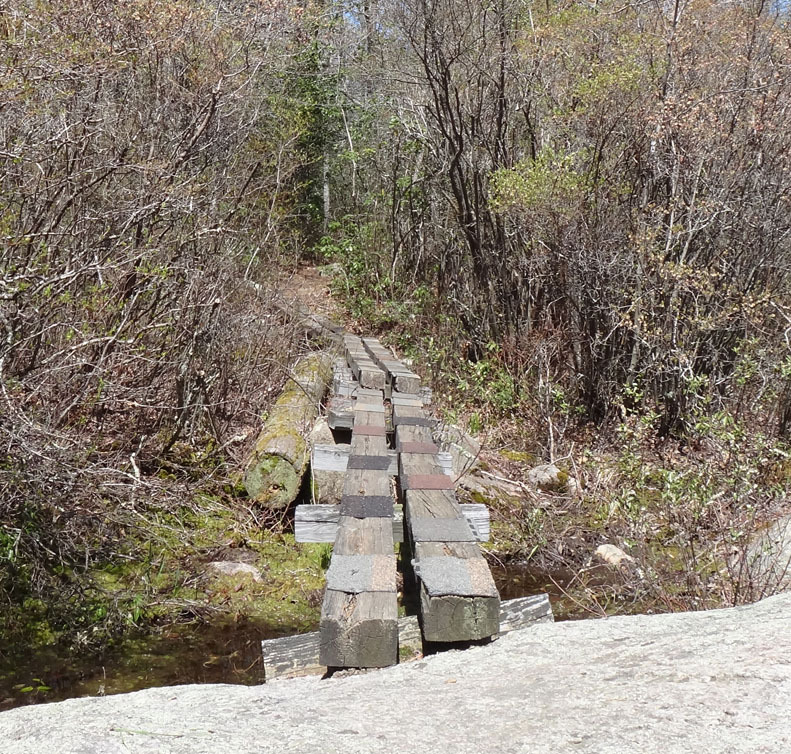 We happened to find the trail that led to Hidden Lake, so we decided to check it out. 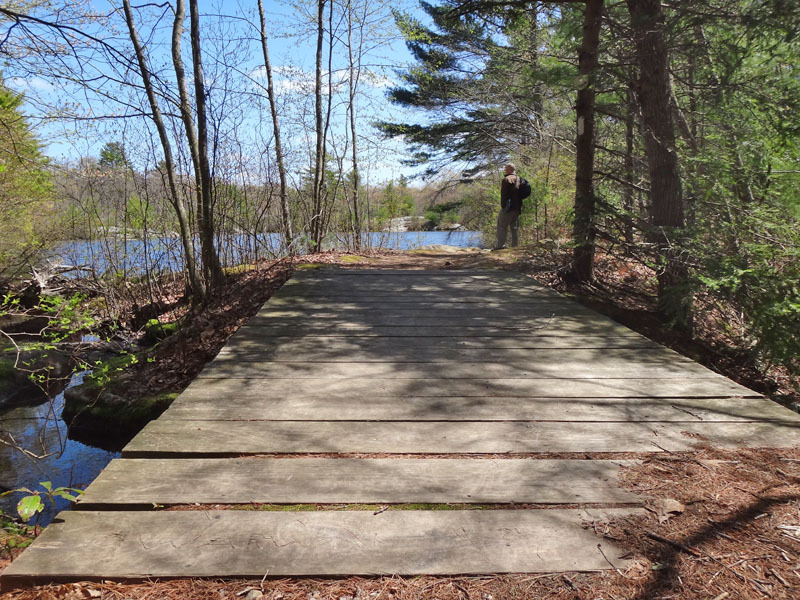 There is a path that goes around the pond, but we just went to the other side since we had the main trail to do, which was on the other side of the road. Gorgeous place to just sit and relax, there are picnic tables here, as well. We left here and headed down the main trail that goes around Yawgoog pond, this area belongs to the boy scouts so you can't hike a lot of the areas in the summer. 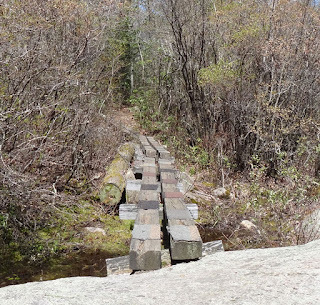 A lot of the trails were a bit wet, so they had ties to walk across. Other areas went through marshy trees where you walked across tree roots and no sign of a path, good thing they marked the trails well, we would never know which direction to go in. 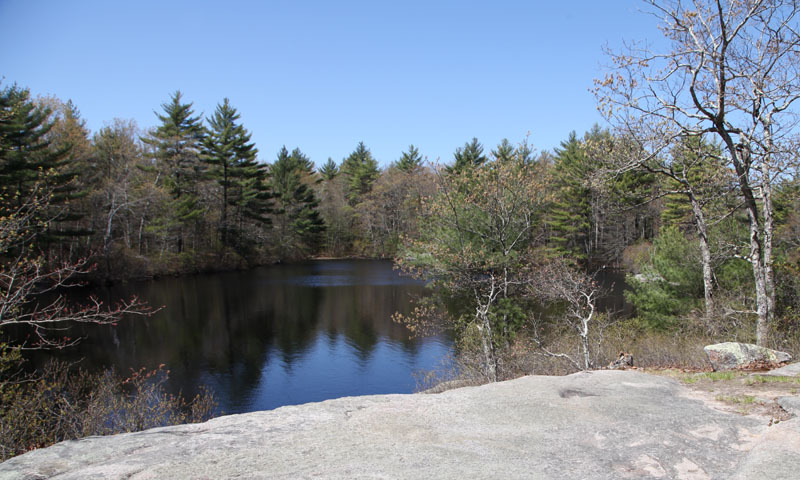 But well worth the effort to get to the areas with views of the pond. 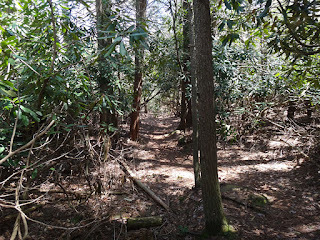 We took a wrong path and ended up heading in the wrong direction, but we also found the rhododendron trail. 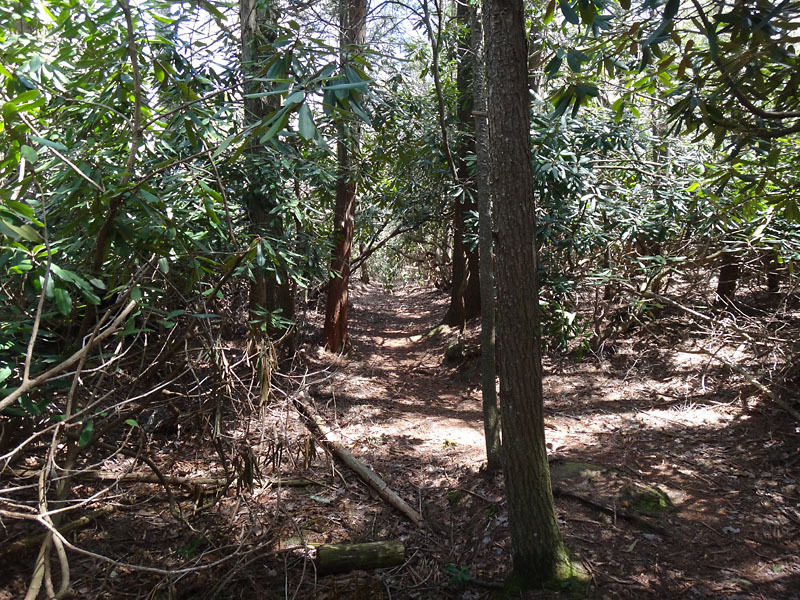 It is about a half mile long and like walking through a tunnel, would love to come back when they are in bloom. So, we turned around and went back to where we took the wrong turn and got back on track. I was getting hot and tired so we quickened our pace and finally got to the boys camp. 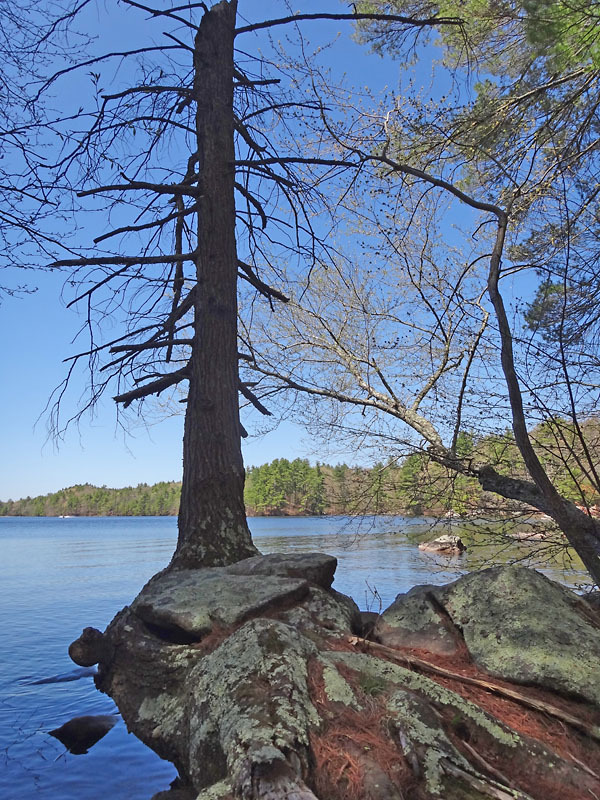 This was a perfect spot to sit and relax and have a snack. It was an easy walk on this side so it gave me a break, then we hit the main trail again and lots of cliff areas, so we had to climb up a few rocks. Great places to stop and enjoy the views. There wasn't enough room for me to get a shot of the surrounding area, lol. And another advantage of being so high is that you see things that are hidden in the tree tops, what a great way to end our hike. 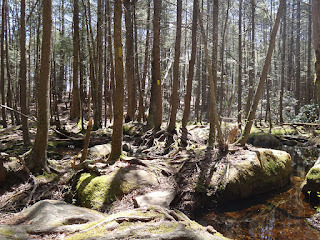 Today was a beautiful day, warm sun and cool breeze, perfect for a hike in the woods. We went back to the pond that we hiked at, last week, but on the opposite side. There are tons of trails so we took the main trail and hiked into Connecticut. 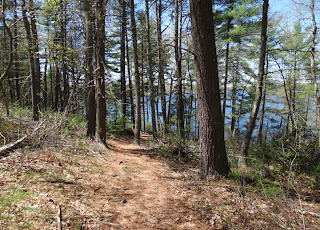 The trail follows the pond, most of the way and winds around as you head towards Connecticut. Gorgeous views, as we walked along. 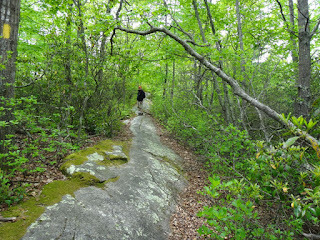 We walked along the path until we reached Connecticut and came back along another wooded trail. 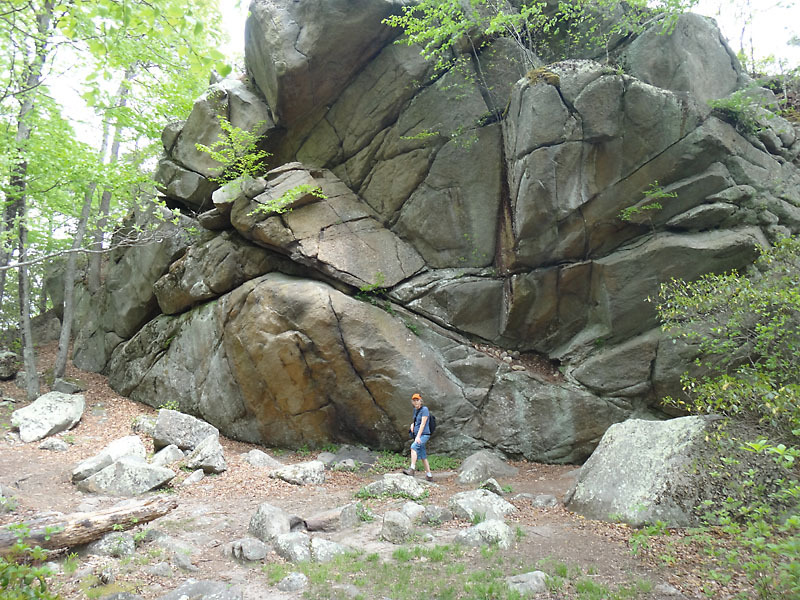 Lots of rocks and ups and downs, so I got my exercise today. 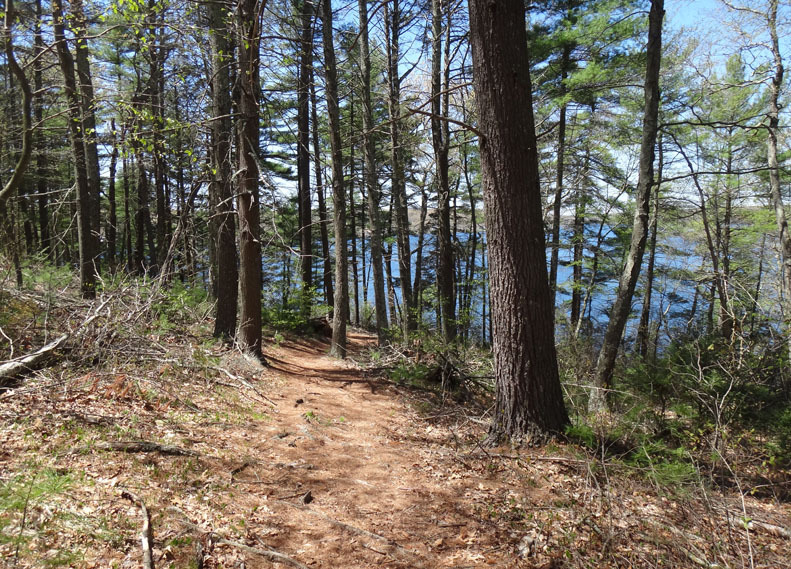 If you have an iphone or android phone, you can use the All Trails app, free version. For free you can find trails or mark you own trails, take photos along the route and share with friends. With the pro you can plan trips or print out maps. 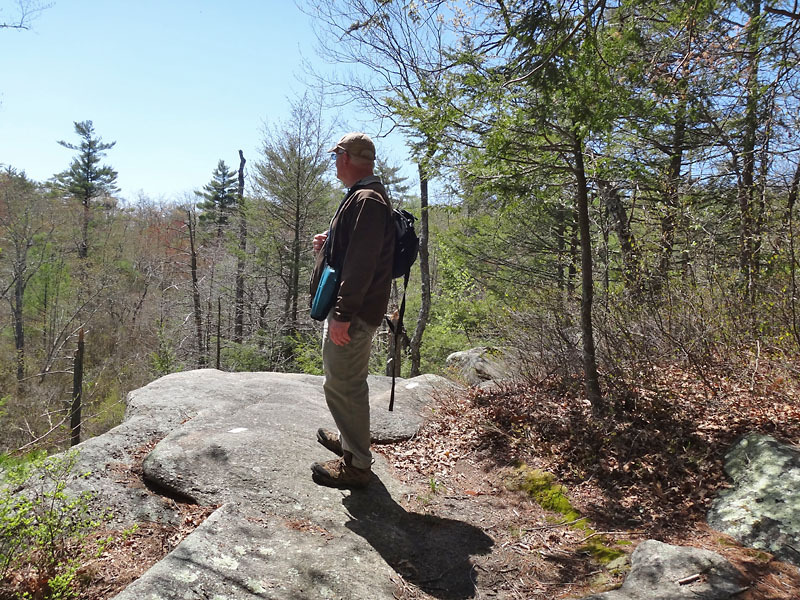 What I like is the fact that I can see where we are going, and how far I hiked. 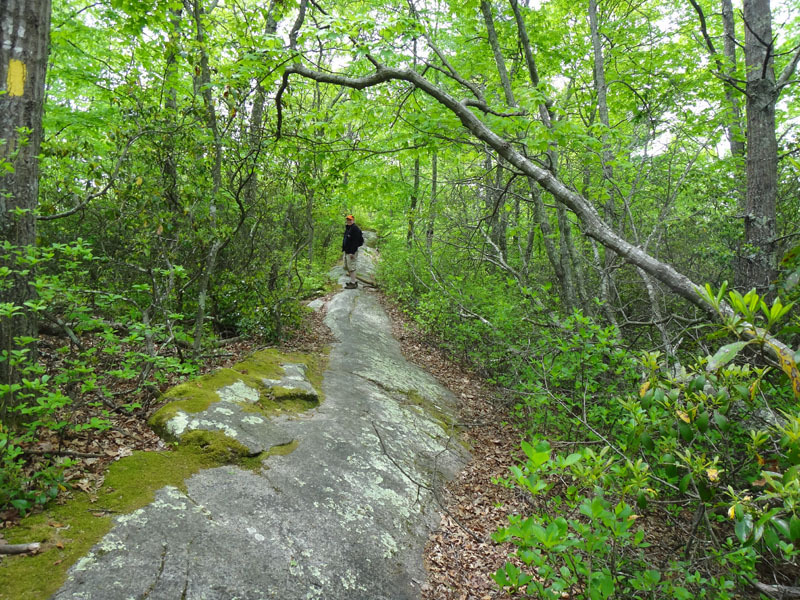 And, if I take a wrong trail, I can find my way back. All of the information is stored on their website, so you can go over the information on your home computer, as well. Another great reason to have a camera phone..... sometimes we forget to put the battery back in our camera;) Luckily I also had my pocket camera in the pack, so I used that for these photos. 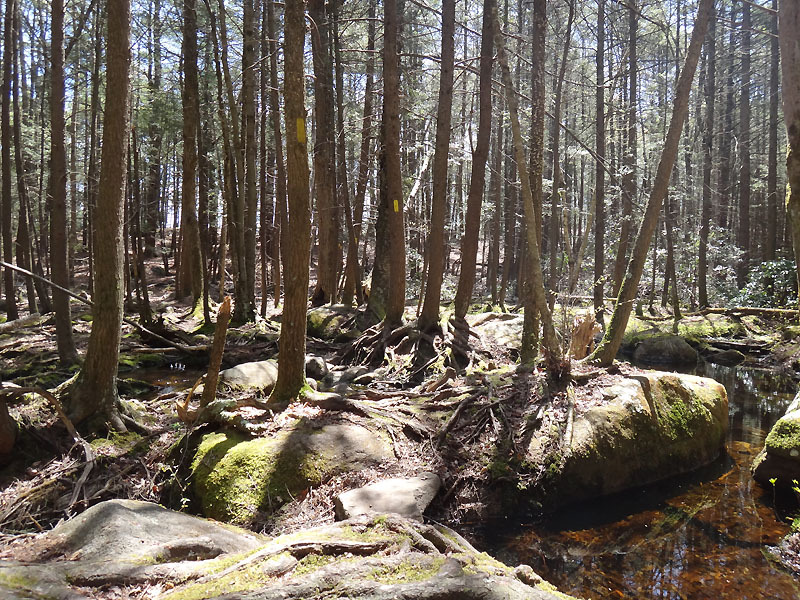 The hike was a lot of hills and easy climbs and a few brook crossings, tempted to go back and try another trail tomorrow. I finally finished the top. Lots of piecing and fixing and stitch ripping and machine acting up, but it all worked out and I finished the top. It is not perfect, I cannot keep my blocks straight, no matter how hard I try, lol. The original pattern came from Connecting Threads in their free patterns. 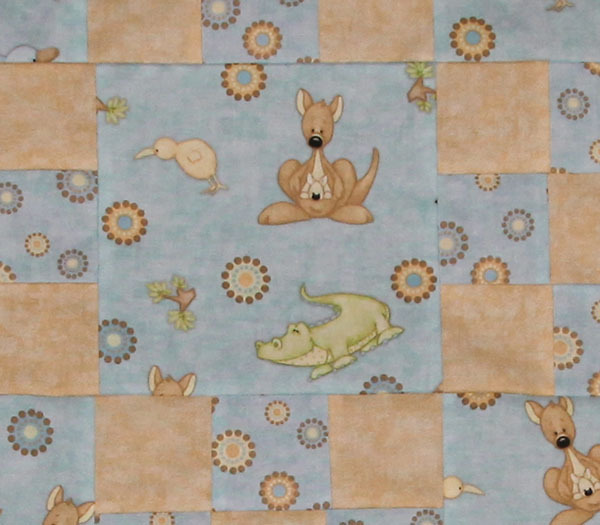 They had the nine patch in the corners, but I decided to add a fussy cut kangaroo, too cute not to use. Now I need to figure out how to quilt it, suggestions are welcome. I want to keep it simple so wondering if I should just stitch in the ditch and maybe X's across the large blocks and maybe a interwoven design for the border? I am going to mix the solid blue with some of the solid yellow or all yellow for the binding? The pieces are not long enough to go in one straight line, so I would have to sew pieces together and think it would look nicer with mixed, than solids that are sewn. I was thinking of using blue thread for the quilting? I still have material to make curtains, so that is next and then enough to make another quilt, so I might use the green shades and do a chisel or tumbler with the dots and then the animal print for the borders. Here is a close up to show the colors better. 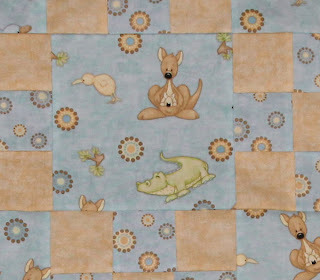 This is such a cute print and I do have larger animal prints that I can use in a second quilt, can never have too many.